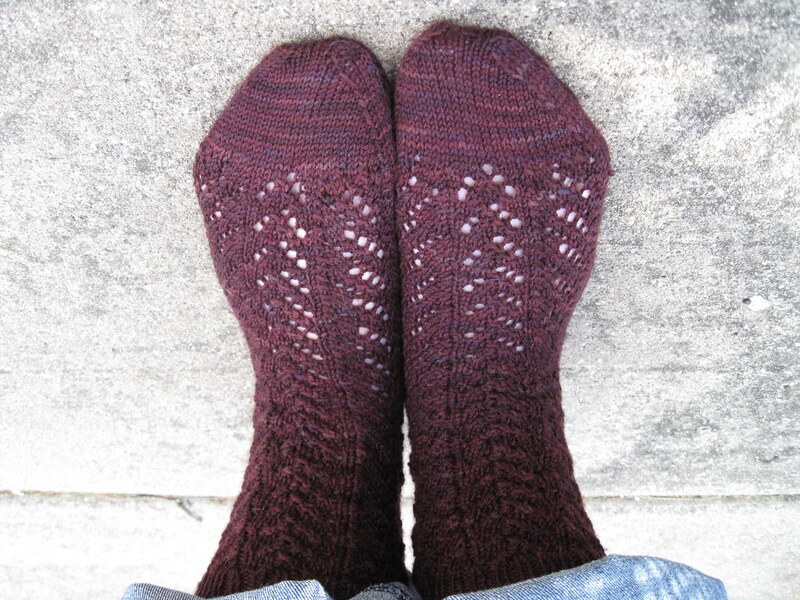 Recently, I received a review copy of Seamless (or nearly seamless) Knits by Andra Knight Bowman. I have to say, I love the idea of this book. 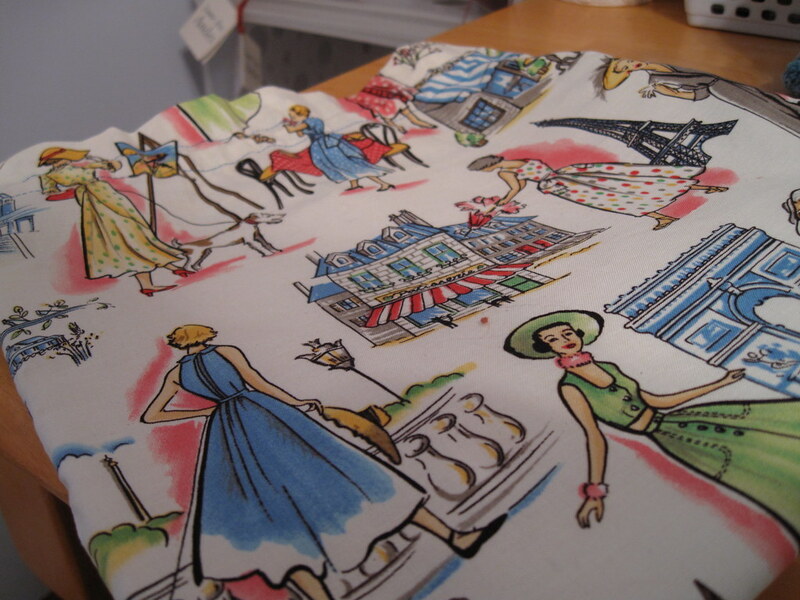 I don't know about you, but I pretty much hate seaming anything. The book title says it all, the patterns require little to no seaming. That is a dream come true for me. The book contains 19 patterns, and are separated by construction type: bottom up, top down, and side-to-side. Most of the patterns are bottom up (there are 10 total in this section). There were lots of cute patterns in this section. The Deb Vest is a garter stitch vest that seems super easy. The Dixie Sweater has an awesome collar that I haven't really seen in a lot of sweater patterns, and the April Cardi is a simple loose cardigan that I could actually see myself knitting and wearing. In the top down section there are four patterns. The one I liked was the Sandi sweater (seen in the cover photo above). I could totally see my knitting BFF, Jenni, whipping up that one up in a weekend. Finally, in the "Somwhat Side-to-Side" section, there were five patterns. My favorite one there was the Patti cardigan. 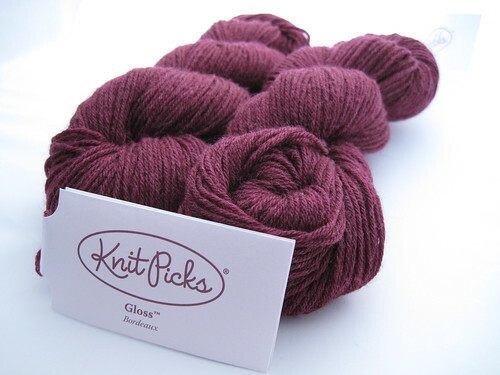 It's knit in different directions, and would be a good addition to any knitter's wardrobe. So, if you hate to seam/finish and want to try some new sweater patterns, I think this would be a good book for you. The patterns are sized up to a 2XL, giving lots more people the chance to make and wear the sweaters! Since I am not much of a sweater knitter, I will be giving away my review copy. Just leave a comment and you will be entered into a random drawing for the book! 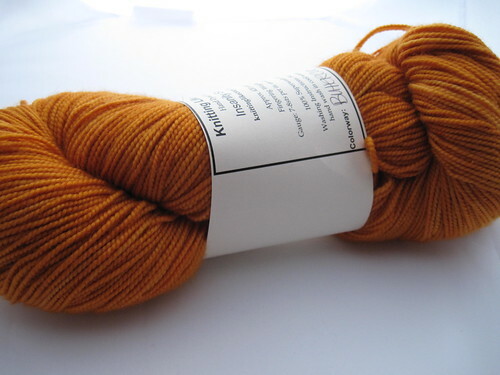 (please include your Ravelry name, or link to your blog so I know where to contact you should you win). I will be drawing the winner on Friday, 7/1! Good luck! Note: I received this book as a review copy from Martingale & Company. For more information, please see my disclosure policy here. 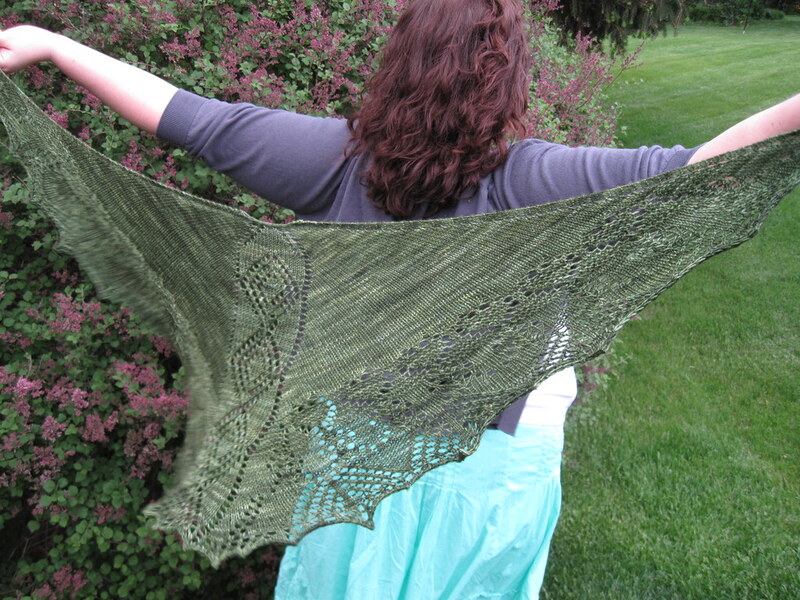 Elation is available as a Ravelry download for just $4.00. It takes a skein of just about any kind of sock yarn. Around 400 yards should do. C'mon, you know you want it knit one. 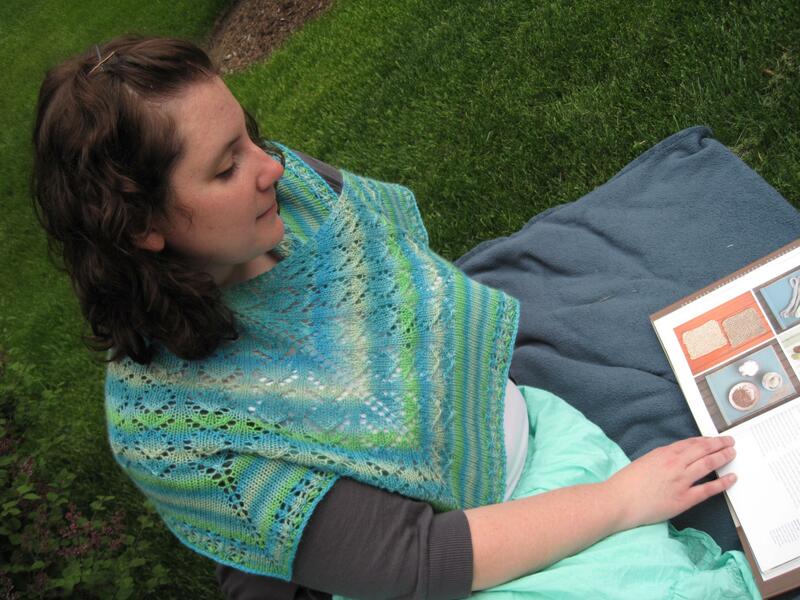 Recently, a received a review copy of Knit Noro. This is one that I wanted to take a look at as soon as I heard about it. I love me some Noro, but basically use it to make Noro Striped Scarves. I love that pattern, but would love to do other things with the stripey goodness that is Noro yarn. This book has a nice range of patterns. There are sweaters/vests, socks, gloves/mitts, hats, scarves and blankets. Basically, there is something for everyone in this book! 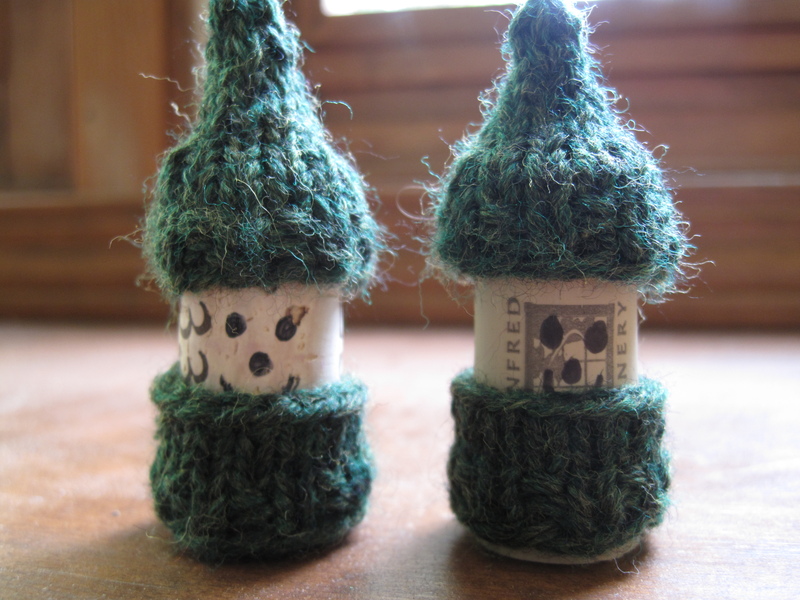 Like any knitting book, there are some things I would knit and some that I would be unlikely to make. But, I have to admit, I was pleasantly surprised at the number of things in here that I would make. Even though I am not really a sweater knitter, I really like the Belted Cardigan Vest and I love love love the Fair Isle Cardigan. 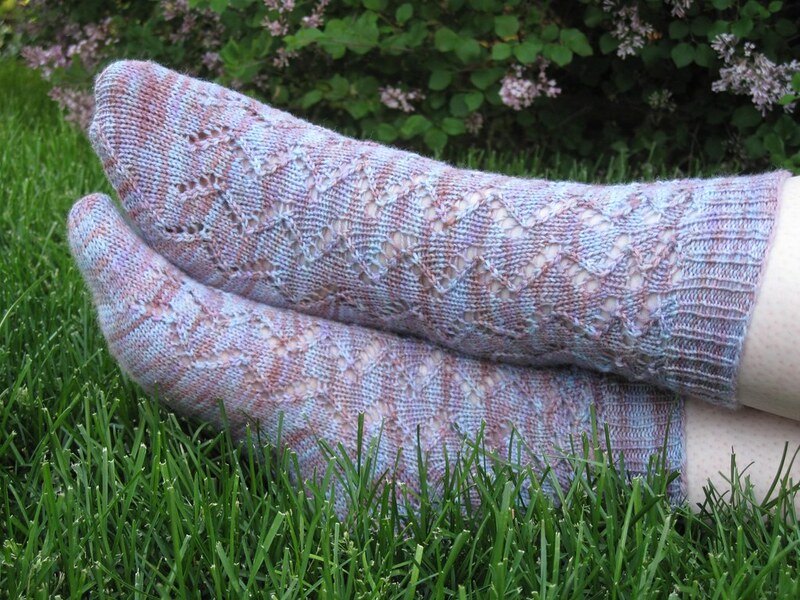 The Ridges Ripples Scarf and Leaf Lace Socks are two patterns that will definitely be going to the Ravelry queue. Even if you are not a fan of Noro, I think you might like this book. There are lots of pretty patterns in here, and they would look good in just about any yarn. Overall, I think this book is a good buy. There are 30 patterns in the book, and most of them are really really good. Especially if you like to knit sweaters and garments, then I think this is a most excellent book to add to your knitting library! Knit Noro retails for $24.95. It's currently on Barnes & Noble website for about $16. Note: I received this book as a review copy from SoHo Publishing. For more information, please see my disclosure policy here. 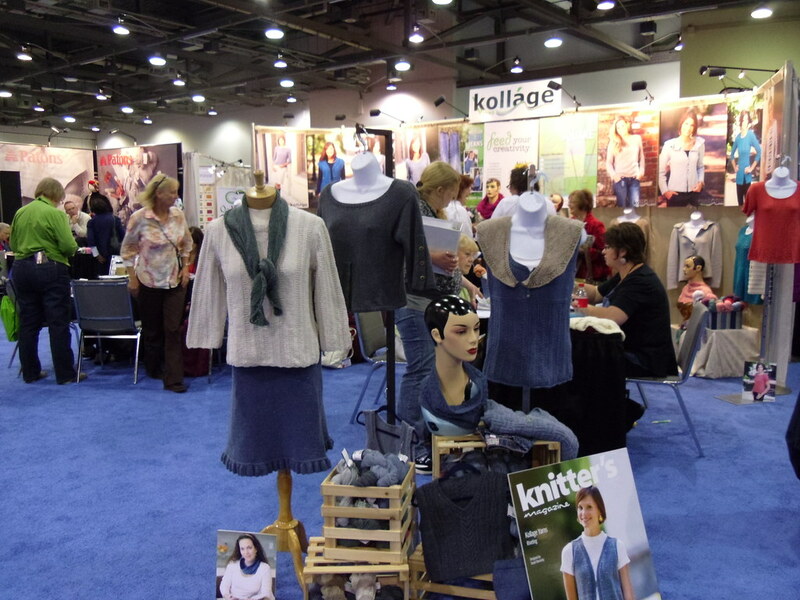 So, my knitting BFF, Jenni, had the pleasure of going to TNNA this year. I was insanely jealous of her trip to Ohio, but she promised me good pictures. She did not disappoint. 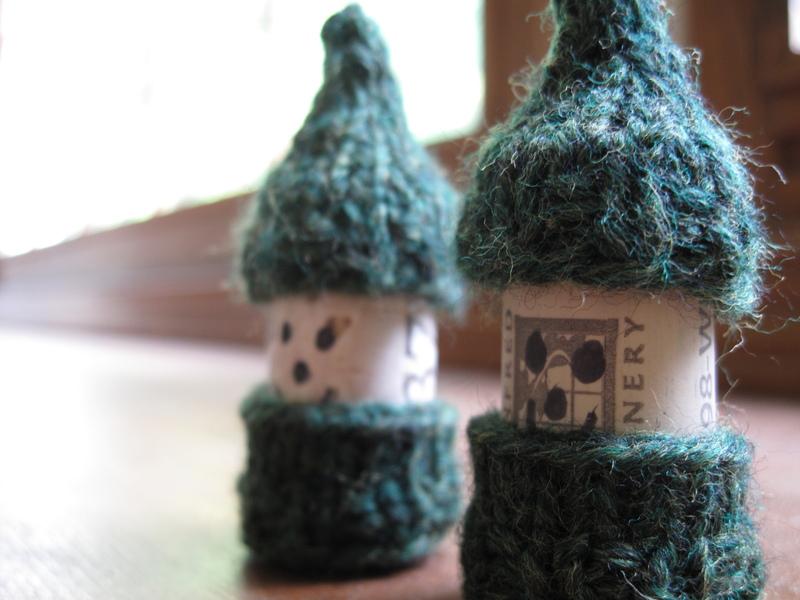 Here are some of her pictures from the Kollage Yarn booth. Both scarves were knit out of Riveting. Seriously, people. 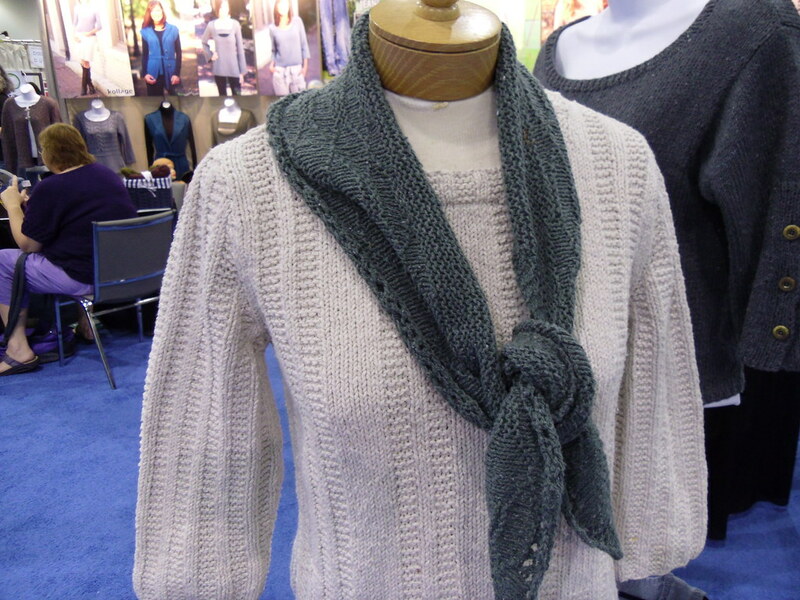 That recycled jeans yarn is so awesome. I am not much of a sweater knitter, but I have a very strong urge to knit a whole sweater out of it. Love love love. ﻿The cowl has a matching pair of mitts, and both are knit out of Kollage 1/2 N 1/2. 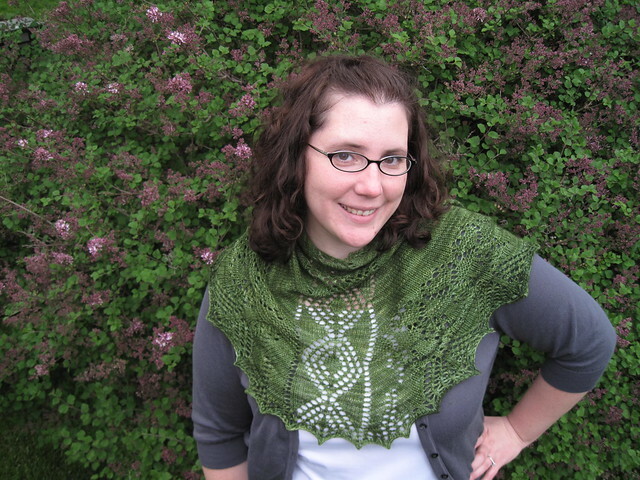 It was so fun talking to Jenni Sunday night, hearing about all the fun she was having at TNNA. I can't wait to see her tonight and pet some of the amazing yarn she managed to get her hands on. I am so very excited to share that I have two designs that will be available through Kollage Yarns Feed Your Creativity Program! 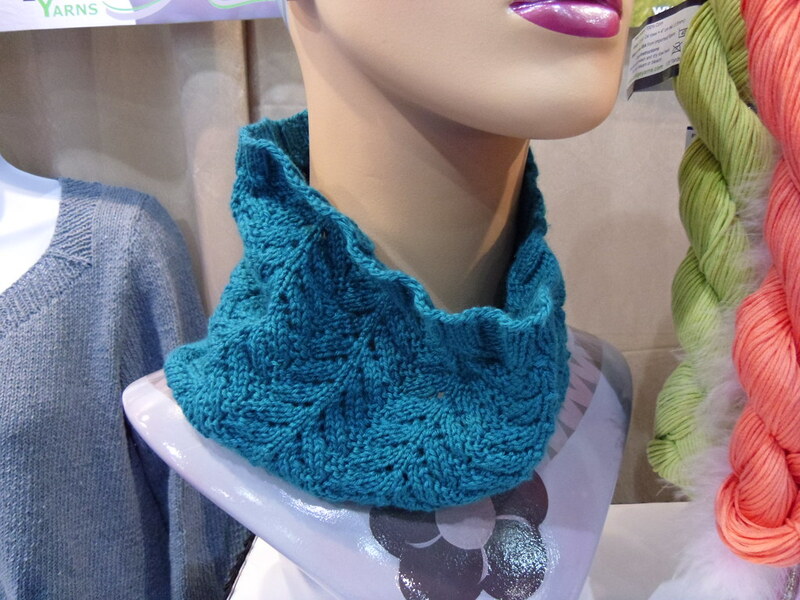 The first one is the Bonnie Jean Scarf knit out of Riveting (love that yarn, you should try it!). The second are the Winchester Mitts, knit out of 1/2 n 1/2. When the patterns are available I will definitely let you know. I am so excited to be a part of the upcoming year's program with some awesome designers like Anne Hanson, Carrie Sullivan, and Sandi Rosner. Working with Kollage over the last few months has been so awesome. I really hope that you enjoy my new patterns. I have been trying to stock up on an extra project bag or two as Sock Summit approaches. Why? Because if it's anything like last time, there will be a major startitis frenzy going on while in Portland. And you gotta keep all those projects organized! I couldn't resist the fancy French ladies. 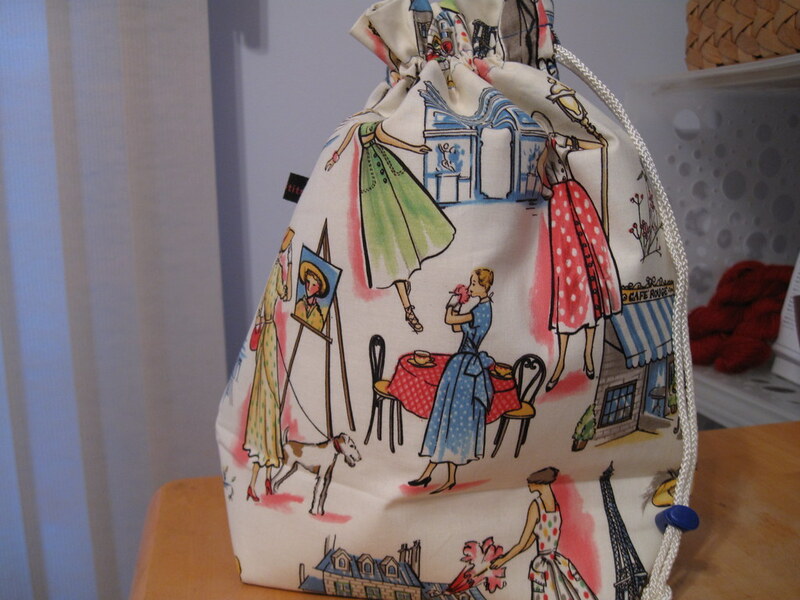 Even the inside of the bag is pretty. 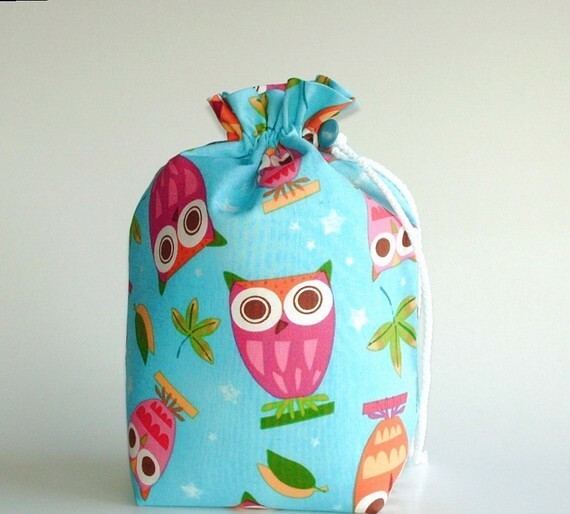 This is drawstring bag is bigger than the normal size ones you usually see. 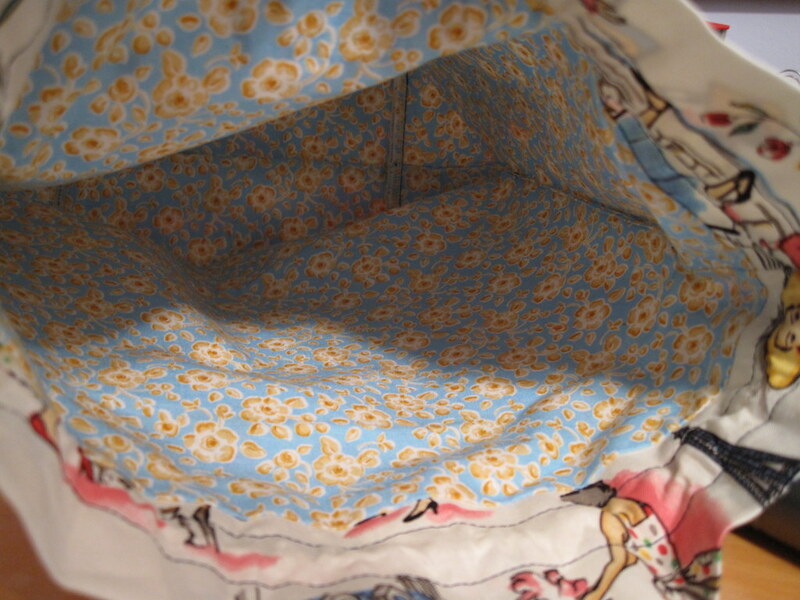 You could definitely fit a large shawl or sweater parts inside it. Or 2-3 sock projects. Just sayin'. With the Mystery Shawl KAL ending on Friday (I will be drawing names at around 5pm Central), I thought it would be fun to look at the prizes one more time. Photo courtesy of ZigZag Stitches. Make sure you post a pic or link in the Ravelry group by Friday, 6/10 to be entered into the random drawing! 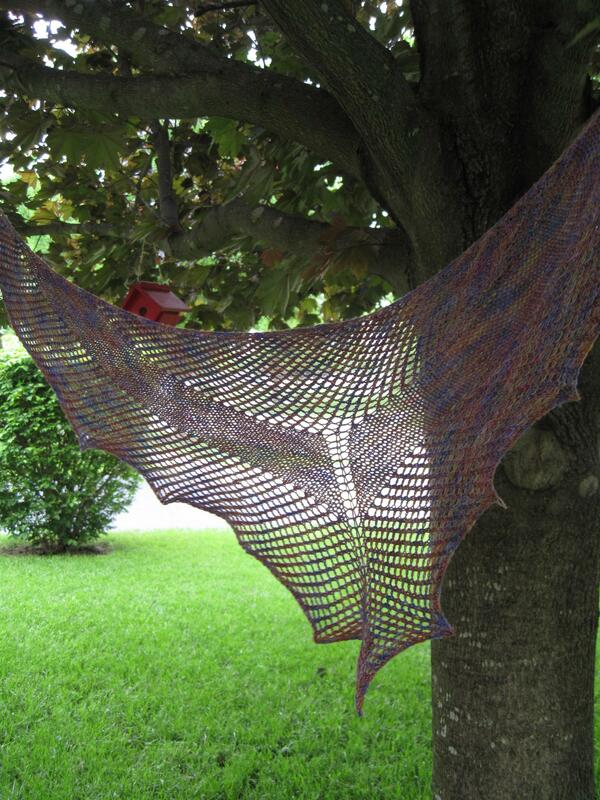 Not on Ravelry, just leave me a comment with a link to the picture of your shawl and I will add you to the list! 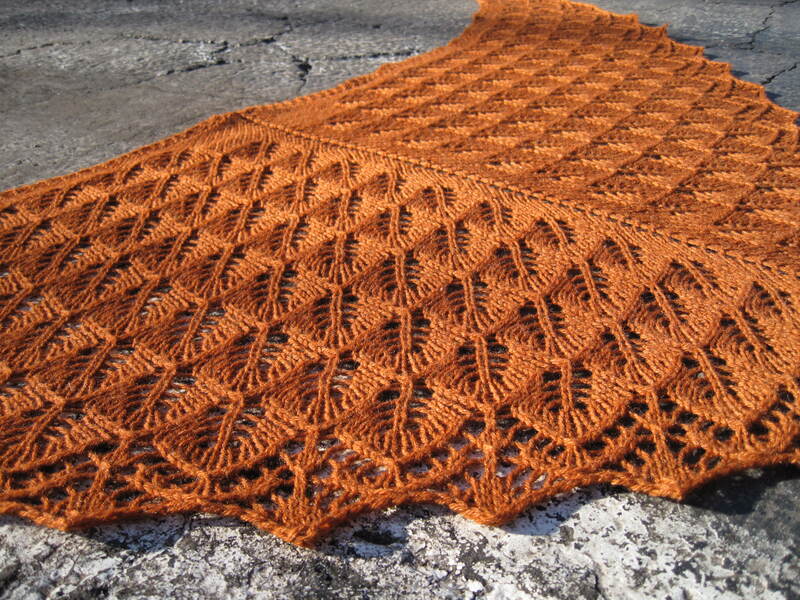 I have had such a great time seeing everyone working on their shawls. I am so pleased with how this shawl came out. I will definitely be wearing this one a lot! 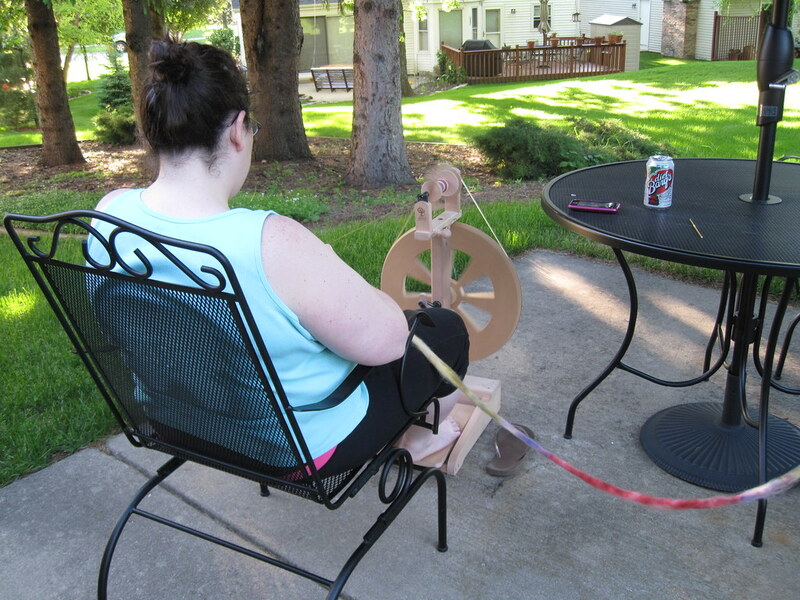 I haven't been in much of a spinning mood lately. But, last night, it seemed like the right thing to do. Hopefully, we will have some nice weather again today and I can do the same thing today when I get home from work.